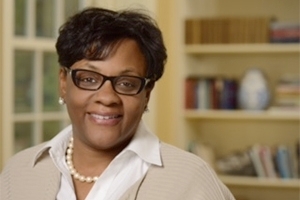 Cheryl Holcomb-McCoy will lead American University’s School of Education as its new dean beginning July 1. An esteemed educator and administrator recognized for her excellence in teaching, diversity research and college counseling, Cheryl Holcomb-McCoy will lead American University’s School of Education as its new dean beginning July 1. Holcomb-McCoy comes to AU from Johns Hopkins University, where she is Vice Provost for Faculty Affairs and a professor of Counseling and Human Development in the School of Education. Holcomb-McCoy’s distinguished career has put her in the forefront of efforts to increase diversity and inclusion in higher education. At JHU, she co-led development of a comprehensive plan to fund research in these areas and increase diversity among the university’s faculty. Until this academic year, AU’s Department of Health Studies and School of Education were part of the same unit—the School of Education, Teaching, and Health. The growth of their respective programs led the university to elevate them into autonomous units. Education programs—Bilingual Education, International Training and Education, Teacher Education, Special Education: Learning Disabilities, and the newly redesigned Education Policy and Leadership program—and their associated faculty now reside in the School of Education. The School of Education is also home to the Institute for Innovation in Education. “We are thrilled that Dr. Holcomb-McCoy will be joining the American University community in such a strong position of leadership. She has had an exemplary career in service to the idea that education is a human right, one that we have an absolute obligation to ensure,” said Stacey Snelling, who has led AU’s School of Education as dean over the past year and is chair of the Department of Health Studies. Holcomb-McCoy’s research and scholarship are extensive. Her work has focused on the measurement of multicultural self-efficacy and cultural competence in counseling, the evaluation of urban school counselor preparation and training, and school counselors’ influence on low-income students’ college readiness. She has authored four books and journal special issues, 16 chapters in edited books, and more than 40 articles in peer-reviewed journals. She is currently an associate editor of the Journal for Counseling and Development and has served on many journal editorial boards, including Professional School Counseling, Journal for Specialists in Group Work, and Journal for Social Action in Counseling and Psychology. Holcomb-McCoy served as a consultant to the Obama administration’s Reach Higher Initiative, and was one of the speakers at the White House’s 2014 Summit on Higher Education at Harvard University. Holcomb-McCoy holds a Ph.D. from the University of North Carolina at Greensboro, and an M.Ed. and B.S. from the University of Virginia.